TOKYO--(BUSINESS WIRE)--Keio Plaza Hotel Tokyo, one of Japan’s most prestigious international hotels located in Shinjuku, Tokyo, will host a special “Spring Cherry Blossom (Sakura) Festival” with menu items specially prepared by our executive chefs in the image of the “Sakura” cherry blossoms and served at eight of our Hotel restaurants including our French and Italian, Chinese, Kaiseki, Korean and other restaurants from March 1 (Friday) to April 30 (Tuesday), 2019. Spring in Japan is a season when numerous highly auspicious events such as college entrance and graduation, and new graduates’ entry to the work force occur and our special menu items are designed to help our guests celebrate these joyous events. Also, our restaurants will accept special requests to include splendid drinks, and specially prepared cakes with meals. In addition, a large and magnificent flower arrangement featuring cherry blossoms will be displayed and will serve as a perfect setting for commemorative photographs for the enjoyment of all guests. 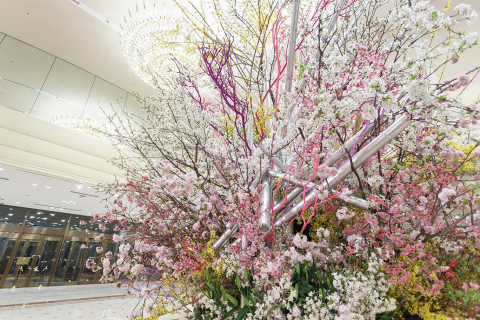 Between March 30 (Saturday) to April 15 (Monday), 2019, a magnificent five meter tall flower arrangement based upon “Sakura” will be displayed in the third floor main lobby. The “Sakura” cherry blossoms, which bloom between the months of March and April and are the most symbolic representation of spring in Japan, have become a focal point of tourism for many overseas visitors. Given the short period of time that the Sakura remain in bloom of one to two weeks, our Hotel restaurants will prepare foods in the image of the cherry blossoms so that our guests can fully enjoy the festive spirit of the cherry blossom season. Keio Plaza Hotel Tokyo (KPH), located in Shinjuku at the very heart of the nation’s capital Tokyo, is one of Japan’s leading international hotels. Our hotel boasts of over 20 restaurants and bars, and we host a wide range of local and international guests who visit us for our welcoming facilities, warm hospitality and unique services that allow them to experience Japanese culture, including our wedding kimono experience, tea ceremony and many others. For more information about our facilities and services, please visit our website, YouTube, Facebook or Instagram. Keio Plaza Hotel Tokyo will host the Spring Cherry Blossom Festival to celebrate the arrival of spring with sakura flowers in March and April, 2019.